This bundle of bright stars and dark dust in this beautiful space wallpaper is a dwarf spiral galaxy known as NGC 4605, located around 16 million light-years away in the constellation of Ursa Major (The Great Bear). This bundle of bright stars and dark dust in this beautiful space wallpaper is a dwarf spiral galaxy known as NGC 4605, located around 16 million light-years away in the constellation of Ursa Major (The Great Bear). 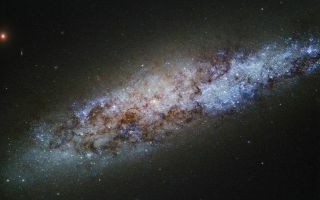 This galaxy’s spiral structure is not obvious from this image, but NGC 4605 is classified as an SBc type galaxy — meaning that it has sprawling, loosely wound arms and a bright bar of stars cutting through its center.